Billions of gallons of water have flowed over the dam since the Water Resources Agency board came together for regional water planning and management in 1977. That year, the Cities of Newark and Wilmington joined with New Castle County to form a policy board and fund the Water Resources Agency for New Castle County. In 1990, the State of Delaware was added as the 4th voting member of the policy board. In 1998 the Governor’s office, the three local governments, and University authorized the WRA to relocate to the University of Delaware as part of the Institute for Public Administration within the College of Human Services, Education, and Public Policy. On campus, the UDWRA mission is to provide water resources assistance to governments in Delaware and Delaware Valley through the public service, education, and research role of the University. The water resources accomplishments of the UDWRA cooperating governments are significant and notable in the areas of policy, planning, and science. The City of Wilmington has followed a regional approach ever since it built the Delaware River wastewater treatment plant, a facility that treats all of northern Delaware’s wastewater. The City is strengthening and expanding Hoopes Reservoir dam to create over 150 mg of additional storage. Wilmington fixed leaking water mains and saved 3 mgd of drinking water that used to trickle into the ground. The City has invested over $10 million and installed million gallon underground tanks to reduce combined sewer overflows. 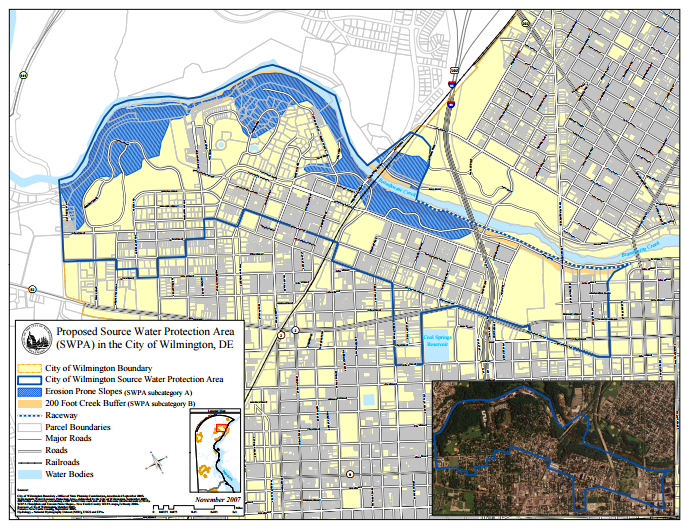 Recently, Wilmington became the first government in Delaware to adopt a stormwater utility to fund sewer improvements. These are just a few of the many contributions of the UDWRA cooperating governments over the last 30 years.